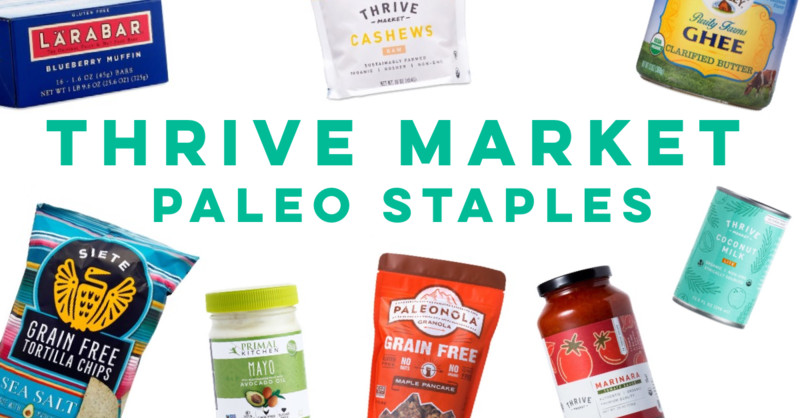 It’s time to talk about my Thrive Market Paleo staples! Since writing about my Whole30 staples from Thrive Market, at which point I had saved over $440 in my first year using Thrive Market, I’ve now saved well over $750 as I’m almost through my second year with the healthy food delivery service. I still often get questions about what’s in my typical order. The short answer is that it’s pretty much everything I’d get at the grocery store except fresh produce. My guess is you’re here for the long answer though, so let’s just get to it. 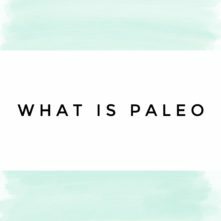 Most of the Paleo options would apply for a Whole30 too, such as the bulk nuts, spices, bars, nutpods, canned goods, grain-free flours, cooking oils, sauces, vinegars and a whole “cart load” of other things. First a little bit about Thrive Market if you’re unfamiliar. It’s basically like Whole Foods and Costco got together and had a baby. And that baby lives online, offers tons of healthy products from home, grocery and kids items, cheaper than anywhere else and delivers it right to your door. They organize products by dietary requirements, like Paleo, gluten-free or vegetarian, or categories, like beauty or food, making it super easy for you to sort through everything. There’s a yearly membership fee of $60, but as I previously mentioned, in my first year of using it I’ve saved $450 bucks and by the end of my second year it will be over $800. Which well makes up for the membership cost. They offer your first month free as a trial! You can even sign up for a free trial and save 20% off of your first three orders. It’s worth it if you ask me, which you did.. I guess ;). I love it so much I got my BFF a membership for her birthday this year. But, before I signed up, I spent a ton of time price comparing products I normally buy. I might have been at work while I did this (don’t tell my boss). But I really did go through and search the Whole Foods website, Amazon site and then compare those to how much it costs on Thrive Market. I was really kind of shocked. They often run specials that I get via email that alert me when they’re giving away free product with your order. I’ll usually wait to place my order until there’s one that I’m interested in. They’ve had a variety of free items that get added to your cart with your order such as Primal Kitchen bars, coconut oil, Epic bar products, Paleo chocolates, etc. I haven’t bought coconut oil in the longest because I’ve gotten two huge containers from these free offers. On my two most recent orders I received coconut aminos and 3 containers of nutpods for free, too! 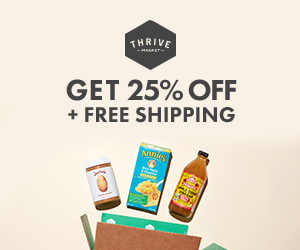 Most of the products like coconut aminos and vinegars (apple cider and balsamic, for example), I buy from Thrive Market. They’re more than $2 a bottle cheaper here and with the way I go through them, on a Whole30 or just in my everyday Paleo cooking, it adds up. Their huge bottle of apple cider vinegar is $2.50. No, I’m not kidding. The other cooking fats and oils are also extremely more cost effective to purchase from Thrive Market. 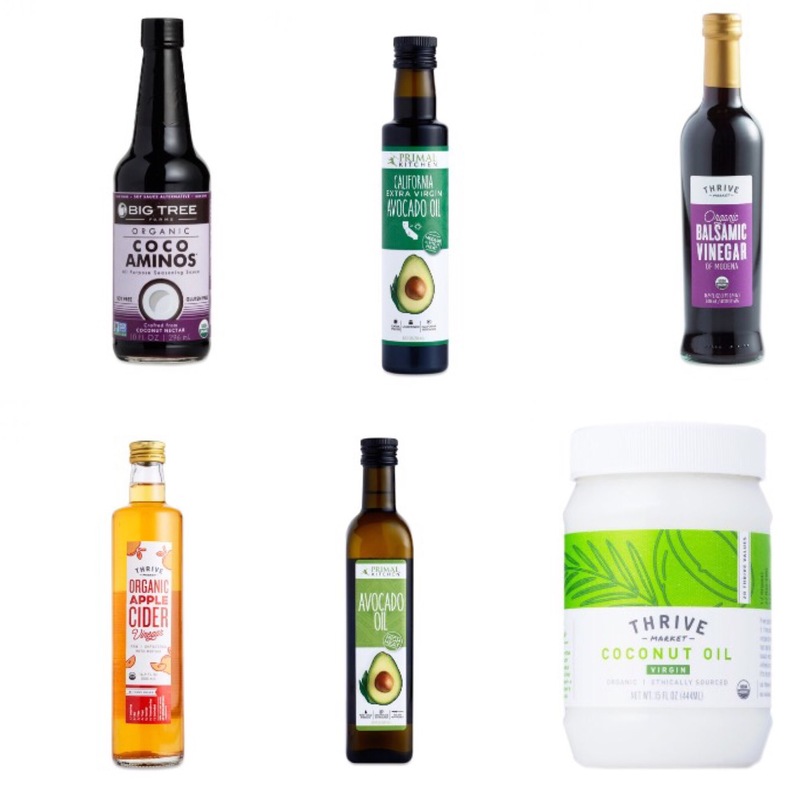 These are great staples because you cook so often with healthy fats, use oils and vinegars to make your own dressings and marinades, and with Thrive, you can do it really easily and for really cheap. Ghee, either the Thrive Market brand or Organic Valley, (a daily staple in my house) is FIVE DOLLARS CHEAPER. Five. Paleo baking flour from Thrive Market will give you a 25% savings if you get it there as opposed to Whole Foods. Canned products are dirt cheap and it’s free shipping after $49 so I don’t have to worry about the weight of the package. Nutpods are a dollar cheaper here than they are Amazon, and I go through a ton of those in my daily coffee routine and cooking as a heavy cream replacement! Coconut cream and coconut milk are $1.50 cheaper than in store. Canned tomato sauce is 40% cheaper and marinara is 45% less expensive than Whole Foods. WHAT. Items like tomato paste (.99 cents), crushed tomatoes, diced tomatoes, fire roasted tomatoes, marinara.. You get the idea, they’re all almost half the cost. They have different flavors of marinara too so I buy a few jars at at time to keep in my pantry. You’ll save 16% on Simple Mills Paleo products. My staples are the Paleo cookies and crackers… in all flavors. They’re so freakin’ good. Almost too good to keep in the house as a staple, ya know? Paleo pancake mix is almost $2 cheaper than in store and on Amazon to get a decent discount you have to purchase three packages at a time. Boo. While we’re on the subject of foods that are almost too good to keep around… Siete grain-free tortilla chips. All three delicious and Paleo flavors, sea salt, nacho and lime tortilla chips are a 20% savings compared to picking these up at Whole Foods. And, if you’ve gone to Whole Foods trying to find these and they’ve been sold out (like… constantly at my local store), you’ll know how awesome being able to get these right to your door when you order them is! Another one of my Thrive Market Paleo staples are meat sticks for easy snacks or healthy emergency food. The New Primal meat sticks (in tons of flavors!) are almost 11 dollars cheaper for 20 sticks. It’s insane, right? Same goes for Lara Bars. They’re $1 per bar on Thrive Market, unlike the price tag at Whole Foods or even at co-ops. Thrive Market’s bulk bags of nuts are all 38%-45% cheaper than Whole Foods prices. It’s a huge savings that’s roughly 10 bucks per bag. They’ve got all the variations you could want to stock up on for salads, nut milks, baking and snacking such as walnut halves and pieces, raw cashews, pistachios, pecan halves, almonds, mixed nuts, the list goes on. 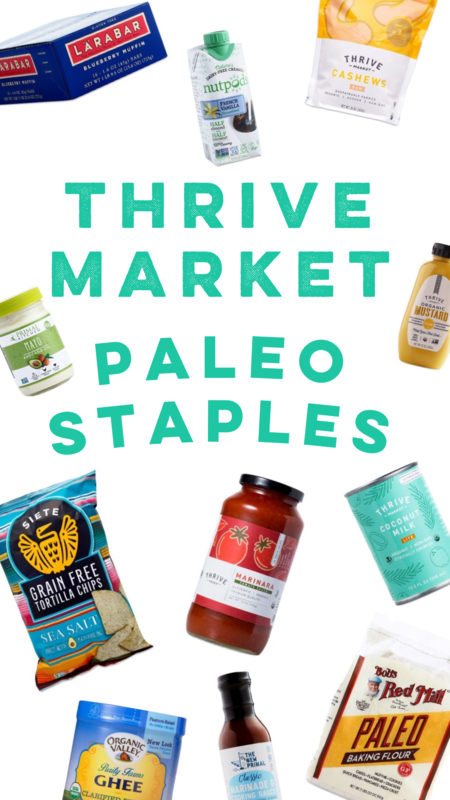 Other things I buy that have became some Thrive Market Paleo staples are shredded coconut, which is only 3 bucks for a bag, Nutiva MTC oil, Primal Kitchen protein and collagen powder, oils, salad dressings, tuna, chia seeds, nut butters and bone broth. There’s tons of different brands of each of these foods so you can compare your favorites for their price and quantity. They also have a huge 24 ounce jar of apple sauce for $3.50. The only ingredients? Organic apples. That’s it. They also have bulk spices that I bought a bunch of back in the first few months of having a membership. I then made up some of my favorite blends like taco seasoning and poultry seasoning into their own jars. I still have spices left from the bags I purchased. WAY less expensive than buying fancy blends. Overall, Thrive Market has been an awesome value for me. If you’re on a budget, appreciate convenience or just don’t want to overpay for eating healthy, I’d seriously consider doing the free month trial at least. I’ve saved lots of money and am always stocked up on the things I need. It makes my grocery days go quicker or throwing together a meal easier. 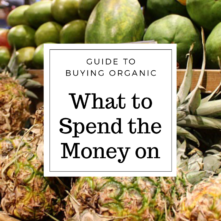 These are just a quick overview of my favorite things and I know you’ll find your own that help you save time and money, too!